Hi, I am interested in your 1983 GMC Sierra 1500 2WD Regular Cab (stock #1213-NSH) listed on Autotrader for $10,995. I'd like to get more information about this vehicle and confirm its availability. This is a good, solid, working mans truck. Its a southern truck its entire life. Is it a modern classic? Yes. They are desirable because they are not only good looking, but very capable trucks. Is this one gussied up with fancy paint and aftermarket accessories? No. And thats the beauty of it. Check it out. 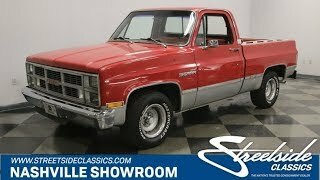 This is a two-owner truck that was passed down from father to son who drove it for 17 years and has decided to sell it now. Somewhere along the way, it received a repaint in its original Red with Silver accent and it still looks good. Up front the grill leads with a GMC badge letting everyone know that this is a Professional Grade machine. It is underlined by a sharp looking bumper which, like the rest of the chrome on the truck shines brightly and is in really good shape. The other chrome includes trim around the wheel wells, drip edge above the doors and trim rings on the steel wheels. Sierra appears on the front fenders and body side molding divides the two-tone paint down the length of the truck. The bed is topped by rather handy bed-rails and the tailgate has a protective strip along the top. This is a working mans truck, and the back bumper has a wry little smile to it that makes you wonder exactly how that happened. Its probably a good story. Open the door and you will find a stock interior which, like your favorite pair of old work jeans, is wearing its miles of service with pride and a little fading here and there. The bench seat is comfortable and has plenty of room for three because the shifter for the automatic transmission is on the column, not occupying floorspace. The column tilts so you can find a comfortable driving position and has cruise control to make those long trips a bit easier. The stock dash is logically laid out and familiar to GMC fans with the speedo in the center and engine gauges off to the left. Ventilation controls in the middle and just below them is a radio with both AM and FM bands for your listening pleasure. Pop the hood and you will find a tried and true 5.0-liter V8 motor nestled down in the engine bay. It is all stock with signs of good regular maintenance through the years. The belts and hoses are in good shape, the battery looks to have been replaced fairly recently, and the air conditioning lines also appear to have been replaced somewhere along the way. The power it makes flows back through a 4-speed automatic transmission to the rear wheels which are mounted on leaf springs. Up front, control arms, coil springs and a beefy sway bar work together with the power steering to make this truck very maneuverable in parking lots and handle well on the road. Power front disc brakes assure that you have good stopping power no matter what kind of load you are hauling, and the rubber meets the road through 275/60R15s all around mounted on steel wheels with polished trim rings. This is a good, honest, southern GMC pickup truck. Come on down and check it out.